The City of Milpitas Department of Public Works is dedicated to providing you, your family, your community and the businesses in our city high quality and reliable water and sewer service. We efficiently serve over 77,000 customers and we’re on the job 24/7. 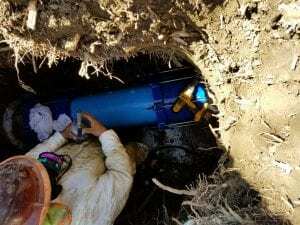 Our water system in Milpitas is made up of underground pipes, pump stations, wells, valves, water tanks and reservoirs. Your water is treated water purchased from two water agencies—San Francisco Public Utilities Commission and Santa Clara Valley Water District—also known as our wholesale water agencies. Water from these agencies is delivered to us and then it goes through our pump stations and pipelines to your homes or businesses every day. As our water infrastructure continues to age, leaks and failures begin to compromise the reliability of our water system. The City of Milpitas has hundreds of miles of water pipelines which are at or near the end of their useful life. It is critical to update and replace infrastructure to continually maintain a safe, efficient and reliable system. Download the water fact sheet. in us a community meeting to learn more or to request a neighborhood meeting, please call (408) 586-2600. Tuesday, January 8, 2019, 6:00 p.m. – 8:00 p.m.
Saturday, January 12, 2019, 10 a.m. – 12 p.m.
Thursday, January 24, 2019, 6:00 p.m. – 8:00 p.m. In 2015, Bartle Wells Associates was retained to perform an analysis of the existing water rate structure to recommend adjustments, and to prepare a rate study. Consistent with BWA’s study recommendation, the City increased water rates on January 15, 2016 and April 1, 2016. the 2015 study projected an additional 8% rate increase (excluding the capital surcharge) would be required on July 1, 2017, followed by a 5% increase on July 1, 2018. These additional increases were not implemented by the City, and this has resulted in losses to the water fund. BWA was retained by the City to conduct a water rate study (Study) and financial plan for the next five fiscal years (FY2018/19 – FY2022/23). BWA’s proposed rates are designed to meet operating reserve targets, fund the water enterprise’s $46.3 million five-year capital program and associated debt service, and mitigate impacts to customers. The Study provides a cost basis for proposed water service rates for the City of Milpitas in compliance with California Constitution Article XIII D, Section 6 (commonly referred to as Proposed 218). Residential Rate Structure: BWA developed a uniform residential rate structure, pursuant to which customers are charged the same rate for each unit of water use. Options for a two-tier structure where higher users pay higher rates for exceeding a set usage level per billing period were explored; however, BWA determined that the City did not have adequate data to identify peaking costs associated with the City’s capital program or City operations and maintenance without additional engineering analysis. 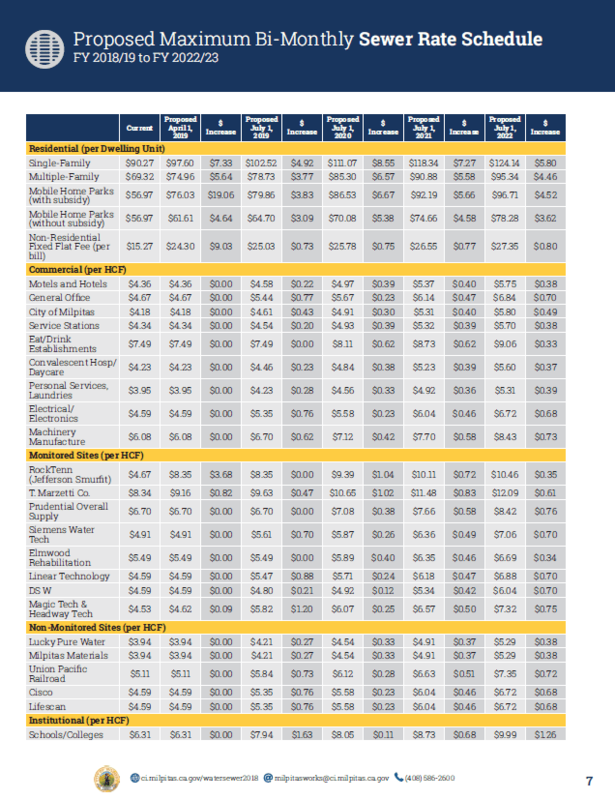 Continue using American Water Works Association (AWWA) capacity standards to scale fixed charges: A substantial portion of the water utility’s costs to operate and maintain the water system are fixed, meaning the majority of costs remain the same regardless of how much water is used by customers. The City recovers a portion of these costs through its fixed meter charges. Aligning fixed meter charges with AWWA guidelines for water meter flow capacity provides a standard cost basis for fixed meter charges. Meter charges are considered “availability” or “readiness-to-serve” charges for providing customers with access to water at all times. These constitute a fixed portion of the customers’ bills because they are levied whether or not water is used. Utilize a long-term debt financing to fund a portion of capital projects with long-term benefit: The City is facing a $46.3 million capital improvement program planned over the next five years. BWA’s projections include a $20 million financing to smooth out the impact on rate payers and ensure intergenerational equity, which includes costs for all projects identified as funded from water bonds in the City’s capital improvement program. Continue to recover capital costs through a capital program surcharge: Since the City will be making substantial improvements to the potable water system, BWA recommends that the City continue to breakout capital costs on each potable customer’s bill. The capital surcharge allows users to see how much of their bill is going to fund water system capital improvements. Phase in rate increases to meet City’s Reserve Policy over time: The City’s reserve policy requires the accumulation of 30% of the annual operating and maintenance expenses of the water system. The proposed rate structure does not provide funds to meet this reserve target until FY 2022/23. BWA determined that the City would need to raise rates by 36.5% in FY 2018/19 to meet the reserve target in that year. BWA recommends that the City phase in the rates to meet fund reserve targets by FY 2022/23 to prevent rate shock and smooth in rate increases. As part of our primary responsibilities, Public Works staff must ensure that it can continue to protect public health and safeguard the environment and this includes our sewer system. Milpitas directly provides sewer collection services to Milpitas customers. Milpitas staff maintain the sewer system to ensure all infrastructure is in good working condition. Staff members clean the sewer pipes and remove buildup, repair and replace aging pipes and maintain the pump stations. 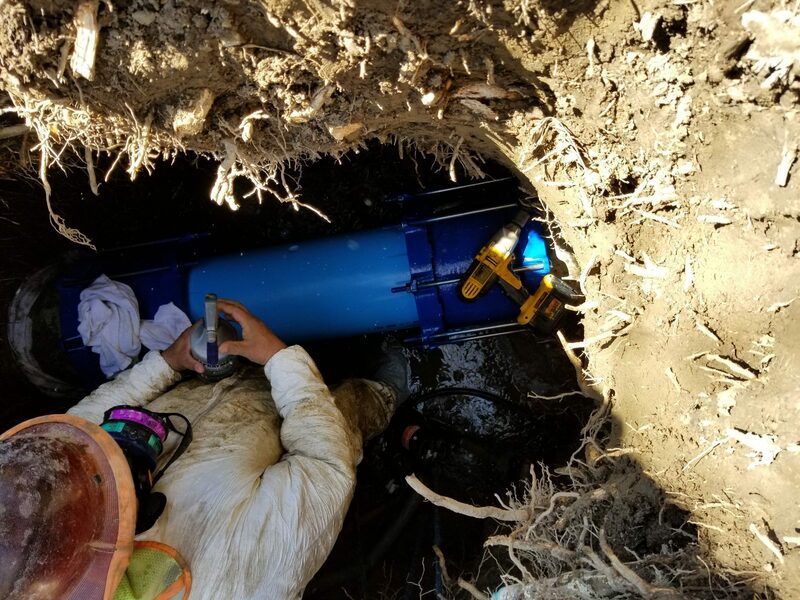 In addition, Milpitas staff work hard to eliminate the number of sanitary sewer overflows and provide emergency response to overflows. This helps quickly mitigate impacts to you and the environment. We contract with the City of San Jose for the treatment of the wastewater generated from the homes and businesses in our city. The City of San Jose wastewater treatment facility is over 50 years old and has reached the end of its life cycle. Major facility reconstruction is needed over the next decade so it continues to operate efficiently and reliably. Milpitas is required to fund its share of the City of San Jose’s cost to operate and upgrade the wastewater treatment facility. Milpitas also needs to address its own collection system capital projects that are necessary to complete in the next five years. Download the sewer fact sheet. Municipal & Financial Services Group was retained to complete a sewer rate study for the City of Milpitas. The study provides a financial plan for funding the operating and capital costs of the City’s sewer system over a five-year planning period (FY2019 through FY 2023), as well as a cost of service analysis and rate study. The report also takes into account the long-term (10-year) financial needs of the City’s system and prepares the City’s Sewer Fund for those long-term revenue needs. 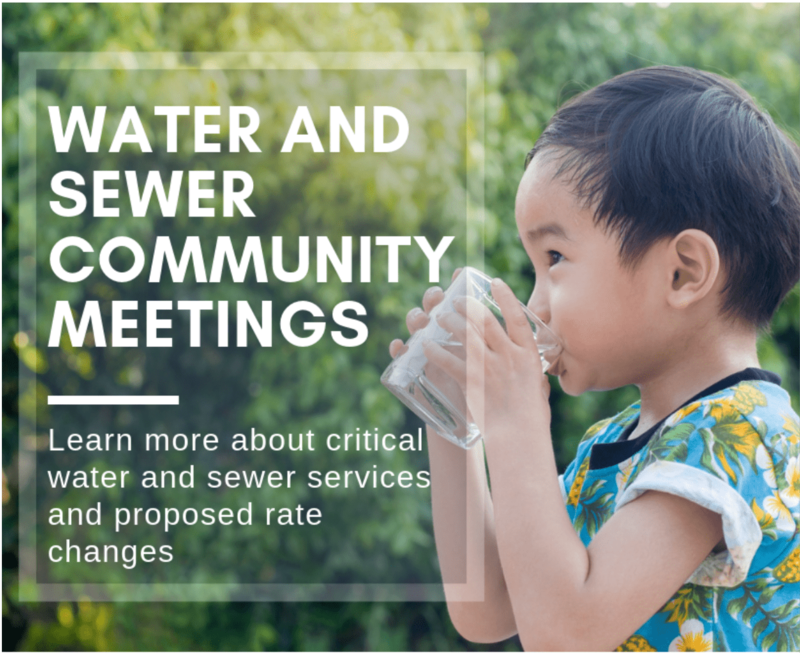 The City needs to increase sewer rates over the five years of the planning period (Fiscal Year 2019 to Fiscal Year 2023) to increase projected revenues to match related expenses. The City will need to increase investment in its buried sewer infrastructure over the short and long term. Given the City’s Sewer Fund balances, rate increases can be phased-in over a number of years to mitigate the one-time impact on the City’s customers. The City implement rate increases through a multi-year financial plan that utilizes both increased rate revenues and the use of a portion of current cash on hand from the City’s Sewer Fund reserves. This will allow the City to smooth rate increases over the planning period and mitigate customer rate shock while meeting both its funding and cash reserve requirements. The City collect 100% of its Personnel Services attributable to the sewer system costs in its bimonthly Flat Fee. The City allocate costs to its Mobile Home Park customer class based on the same flow assumption used by the City of San José to allocate operating costs to the City of Milpitas, which is 63 GPD per person and 2.24 persons per dwelling unit, which equals 141 GPD per dwelling unit. The City adopt new rates for the next five fiscal years. Gain knowledge and understanding of out Water infrastructure, costs, health & safety, regulatory requirements, maintain and capital improvements. The Task Force first met in November 2016 and continued to meet throughout 2017. Agendas, agenda material and Minutes can be found by visiting the Task Force webpage. Response from the City: The Water Rate Study conducted by Bartle Wells Associates (BWA) notes that changing the rate structure from a single charge per unit to a tiered rate where customers pay more once they exceed a set level of usage presents both financial and legal challenges. A financial downside of implementing tiered rates is that the water enterprise would have to rely more on highwater users to meets its revenue requirements. A uniform rate structure provides greater revenue stability than a tiered rate structure because they provide a more consistent revenue stream. Recent court decisions have focused on how tiered rates are calculated. The appellate court decision in Capistrano Taxpayers v. City of San Juan Capistrano clarified that tiered rates must reflect the proportionate cost of providing the service within each tier. There is specific criteria needed to implement a tiered rate system (see page 8 of the Water Study) as the basis for establishing tiered water pricing is based upon the specific costs, characteristics and usage patterns of a utility’s customers. BWA determined that the City did not have adequate data or resources to identify peaking costs associated with the City’s capital program or City operations and maintenance. The City Attorney concurs that, at this time, there is not adequate data to legally support implementing a tiered rate structure. The Task Force recommended that the City review the Cost Allocation Plan and evaluate, in detail, the relative cost and benefits of implementing a comprehensive labor recording system to enhance financial reporting, labor accountability, and internal controls. Response from the City: On November 29, 2018, the Fiscal Year 2018-19 Central Services Full Cost Allocation Plan Update (CAP Update), which was prepared by ClearSource Financial Consulting, was presented to the City Council. The CAP Update was revised from what was presented to the City Council on September 18, 2018 and included an enhanced description of cost allocation bases, as well as central services indirect rates for every City department. As a result, the CAP more accurately captures the indirect costs to various direct services. Staff will return to Council on February 5, 2019 to present final plans to offset any negative General Fund revenue impacts as a result of the CAP Update. Staff will also provide an update to the City’s Five-Year Financial Forecast. In addition, Matrix Consulting Group is currently conducting a development fee study to access user fees charged to developers and other parities. This fee study will look to capture the full cost of services and as a result, it is anticipated that developed based fees could increase. This will ensure that developers and other parties pay a fair and reasonable share of City costs in relation to the services provided to them. The development fee study is anticipated to be completed in April 2019. The Task Force recommended that the City Council remove the 10% reduction in water use policy in place, allowing residents to increase their HCF usage and, in doing so, reduce the cost requirement and safeguard the City’s water allocation. Response from City: This recommendation was discussed by the City Council at their January 16, 2018 meeting. Following public testimony and Council deliberations, the Council took no action but noted that the issue should be re-visited when more data was available. The Task Force suggested that the City investigate the possibility of providing assistance to persons living at or below the poverty level. Response from City: Staff is working to develop options to present to the City Council for consideration during the budget process so that the program and funding for alternatives may be considered with all City needs. The Task Force recommended that the City utilize internal and external communications using various traditional and non-traditional methods to inform residents of future water rate changes in an attempt to ensure that the public is well-informed. Response from City: The City retained the services of Lucy and Company to assist with outreach efforts. To date, there have been two community meetings, which have been advertised on the City’s website, social media accounts, government access channel, email blasts, media advisories, and through printed flyers placed in City facilities and distributed to stakeholders in multiple languages. In addition, this website is updated regularly, which includes a fact sheet, frequently asked questions, and links to pertinent information. The next community meeting is schedule for January 24 from 6-8 pm at the Milpitas Community Center – please join us! In addition, City staff are available for neighborhood/HOA meetings. Please call (408) 586-2600 to schedule. Are the indirect costs of water higher than last year? How can I receive materials in another language? How are the proposed sewer rates structured and what is the proposed rate? How do I know what my new water rate would be if approved by Council? How can I protest the proposed increases? When will the City Council consider approving the proposed rate changes? What is the balance of the water fund? Why is the sewer rate increase necessary? Why is the water rate increase necessary? The indirect costs for this fiscal year have actually decreased this year over last year. The Cost Allocation Plan study recently completed ensures that the costs being charged to the utilities are the most up-to-date and accurate. 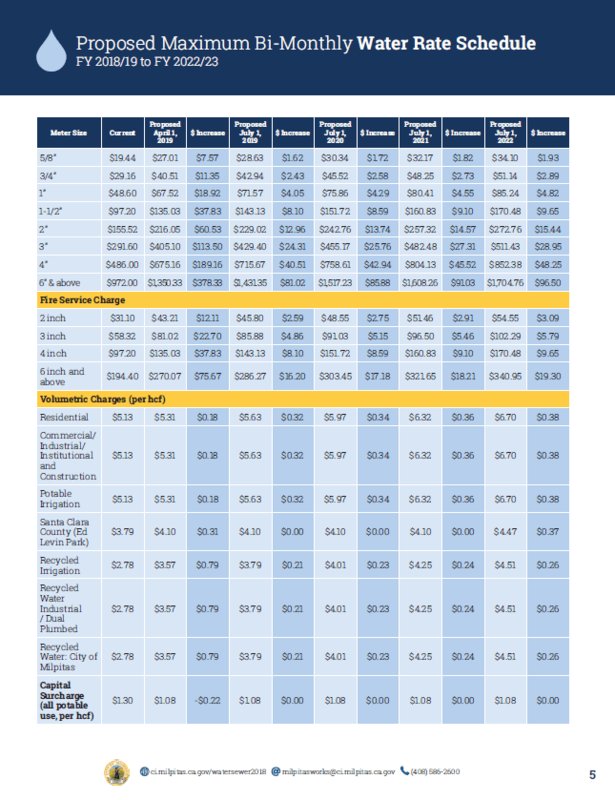 As a result of the study, staff charges going towards water and sewer utilities have decreased over the prior year. The City of Milpitas wants to ensure that the entire community has access to critical information regarding the water and sewer systems. To request printed material in any language, please contact the Public Information Officer, Jennifer Yamaguma at (408) 586-3055. The City is proposing to charge customers for sewer service based on customer classes, including residential and non-residential. Residential customers are further categorized as single-family, multi-family, and mobile home parks. Non-residential customers are broken down into commercial customers, monitored sites, non-monitored sites, and institutional customers, and each class of non-residential is further broken down into sub-classes. Customer classes are determined based on common sewage characteristics, including flow and strength (units of pollutant per quantity of sewage) of sewage, and accordingly, common patterns and levels of demands placed on the sewer system. As such, different rates are proposed for each type of residential use, and for each non-residential sub-class. 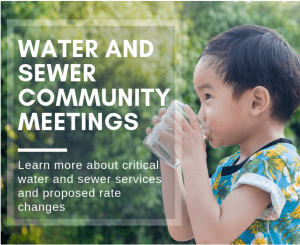 For residential customers, the proposed sewer rates consist of a flat bi-monthly charge per dwelling unit, which varies depending on whether the property is single-family, multi-family or mobile home residential. For non-residential customers, the proposed sewer rates include a bi-monthly fixed flat fee, and an additional variable charge, measured by hundred cubic feet of metered water consumption. While the fixed flat fee is uniform for all non-residential customer classes, the rate for the variable component will depend on the type of non-residential use, and is determined based on shared characteristics of strength and flow of sewage. Click here for the Proposed Maximum Bi-monthly Sewer Rate Schedule for Fiscal Year 2018/19 to Fiscal Year 2022/23. Capital surcharge, which collects funds for the City’s capital program, allowing for the reinvestment, replacement and refurbishment of the assets that are essential to providing safe drinking water. The capital surcharge is imposed on all potable water customers, measured in dollars per hundred cubic feet of potable water delivered to the property. Recycled water customers do not pay the capital surcharge because they do not benefit from the infrastructure funded by the surcharge. In addition, the Santa Clara Valley Water District imposes a fire meter charge for properties served by a private fire meter. The fire meter charge is determined based on the size of the fire meter serving the property, and is only imposed on properties with a private fire service meter. The proposed water rates will phase in the increases over a five-year period, commencing April 1, 2019 and each July 1 thereafter, beginning July 1, 2019, through and including July 1, 2022. Click here to view the proposed maximum bi-monthly water rate schedule for Fiscal Year 2018/19 to Fiscal Year 2022/23. The City Clerk will count all timely written protests and report the total to the City Council. Written protests must be received by the City Clerk’s Office no later than 5 p.m. on February 5, 2019 or be submitted in writing in the Council Chambers before the public hearing is closed. At the City Council meeting of February 5, 2019 at 7p.m., the Council will consider approving proposed changes to water and sewer charges. If approved, the rate adjustments will take effect April 1, 2019 and will be adjusted over a period of 5 years, in accordance with the rate schedules. The water fund is quickly depleting. The fund is projected to lose $1.36 million in 2018. This puts your water utility at risk. The primary reasons for the proposed sewer rate increases are to pay for the City’s share of maintenance, operational and capital improvement costs for the City of San Jose’s Regional Wastewater Facility. San Jose treats the sewage generated by Milpitas. The costs are essential to allow for the treatment of wastewater collected throughout the City. Our own sewer system also requires capital improvements to ensure the safe and reliable collection of wastewater generated by residents in the City. The primary reasons for the proposed water rate increases are to pay for increased cost of wholesale potable water from the San Francisco Public Utility Commission and the Santa Clara Valley Water District, and the increased cost in purchasing recycled water from South Bay Water Recycling. Our water fund balance is depleting since we have not passed on cost increases from wholesale water purchases since 2016. Our water system also requires capital improvements to ensure the safe and reliable delivery of water to residents 24/7.